A family of seven were found by police after an empty dinghy was spotted drifting off the coast of Kent, the Home Office has said. The group - a mother, father and five children - have been transferred to immigration officials for interview. 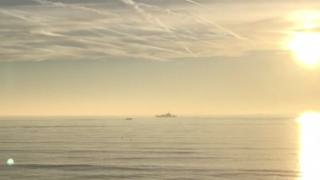 The Home Office said the boat, seen off the coast at Kingsdown at about 04:20 GMT, was recovered a mile offshore. Four lifeboats were launched and the Coastguard helicopter was scrambled in an effort to locate it. The Border Force was "confident" the vessel had been used for a migrant crossing, the Home Office said. "Today Border Force responded to an incident in Kingsdown, Kent, following reports of a boat in the Channel. "Since the home secretary declared a major incident in December we have tripled the number of cutters operating in the Channel, agreed a joint action plan with France and increased activity out of the Joint Co-ordination and Information Centre in Calais." The Home Office said the number of people trying to cross the Channel fell from about 250 in December to about 90 last month, adding that roughly half of the January attempts were intercepted in France before they could make it to British waters. HM Coastguard said earlier that it helped Border Force officials in the search. The RNLI said an earlier report that a migrant had walked into Walmer lifeboat station was mistaken. On 18 February, 34 people - including men, women and children - were brought to shore at Dover from a small boat discovered in the Channel. At least 91 people have made the 21-mile journey between France and England in small boats this year.